It is September 11 again. Outside, it is clear and cool. It will be a sunny crisp September day today… just as it was then. 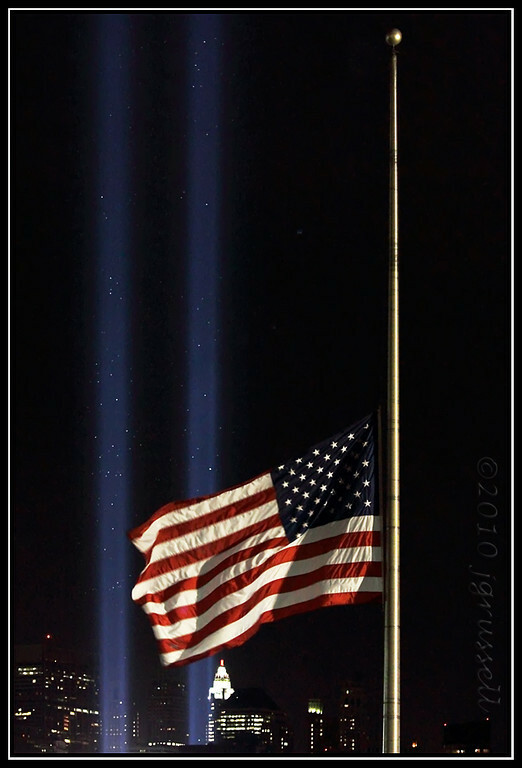 And we pause, as we have paused every year since then, to remember that day. That day. Eleven years ago. September 11, 2001. As has been the case in each of the years since 2001, this anniversary is marked by official remembrances. At the Pentagon, outside Washington D.C., where nearly 200 people died. At Shanksville, Pennsylvania, where the courageous passengers on United Airlines Flight 93 sent their hijacked plane into the ground to protect the intended target in the nation’s capitol, giving the 40 lives of the passengers and crew instead. At Ground Zero, in lower Manhattan, where more than 3,000 people died, immediately or in the days, weeks, months and even years since. As has been done every year since 2001, the names of those lost at the Twin Towers will be read aloud again today at Ground Zero, by members of the families who lost loved ones. The readers will pause time and again for a moment of silence. As they have every year since 2001, church bells will ring out across the city to honor those lost. 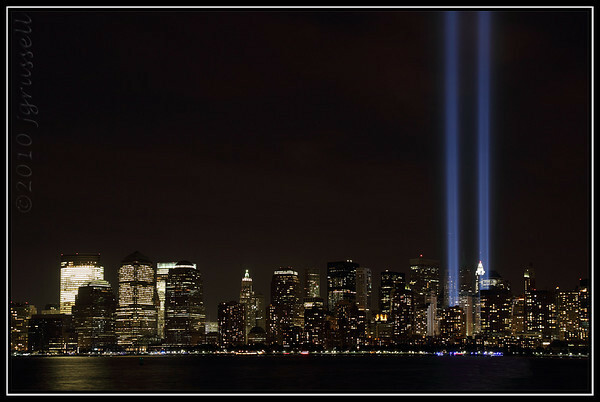 As it has in each of the years since 2001, the tribute of lights, depicted above and below, will shine into the skies above Ground Zero tonight. And, once again, we will weep. I have been writing and posting these 9/11 essays every year since 2001.1 For nine years, I wrote in anger and despair. It was beyond comprehension that those responsible had not been brought to justice. And then, last year, still angry, but no longer in despair, I could write that the man responsible for that terrible day in 2001 — Osama bin Laden — had been brought to justice. Finally. At long last. He was dead. There is some solace in knowing that he is gone. But still… still we weep. We weep for all those who were his victims. For those who perished. For those who lost husbands, wives, parents, children. For those who never grew old. For those who never grew up. We weep for the wounds that are still so raw. Like so many others here, I am still easily brought to tears by reminders of that terrible day. Like so many others here, I cannot watch the memorial programs. I cannot listen to the bagpipes. I cannot bear the photos. I fear that we will never really heal. I don’t know if we who have lived through these terrible events will ever fully recover. 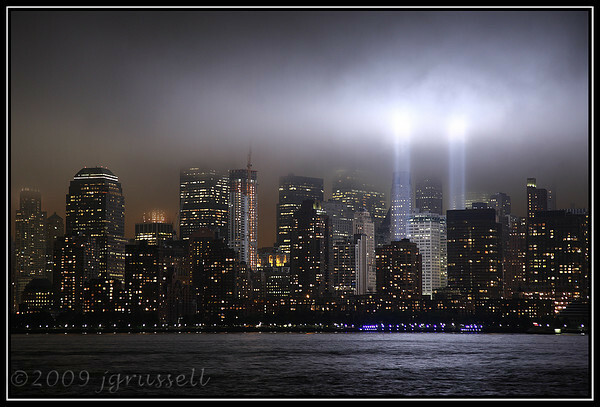 We weep for what we all lost that terrible day 11 years ago. An innocence, a sense of security, and a joy in living. The terrible price we have paid for what madmen chose to do to us wasn’t just the horrific loss of life. But the loss of a way of life too. We will never be as carefree, as brash, as confident. We will never believe in ourselves, in our safety and our security the way we did before that terrible day. And we weep for what could have been. Americans stood together after 9/11, shoulder to shoulder, men and women of all colors, sizes, shapes and creeds. Determined. Committed. And above all else, united. Not Republicans or Democrats. Not Christians, Muslims or Jews. Not liberals or conservatives. But Americans all. It was magnificent. And then it was gone, as politics-as-usual took its place. It continues to be so very tempting, this year as it was last year, to say that we have had enough of grief. To let the physical memorials take the place of the horrific memories of that terrible day. To say that it is time to look forward and not back. But I made a promise that September all those years ago. A solemn pledge that I would remember. It is time now to keep that pledge on this anniversary. It is time again to remember. To open, once more, the film cannister into which I brushed some of the dust of Ground Zero. To touch that dust with my own hands. And, once again, to stand witness. To make sure that I do not forget. That we do not forget. That no-one forgets. That all those lives will never be forgotten. Judy, very well said. Wonderful essay! Thanks, Donna. This day is always so very hard. Like you I don’t need the memorials to remember. Or the photos — though the ones I received this year of the rescue dogs who were there did bring tears to my eyes. I’d been in NYC four days that morning after coming up from a conference in Philadelphia. I spent a lovely weekend with friends, had a Monday meeting with editors, and was intending to fly out on Tuesday the 11th. I didn’t. I will never ever forget. I can remember it as if it were this morning. Barbara, it was bad enough from my side of the river. I can’t imagine what it must have been like to have been in the city that morning. Thank you, Judy. In the eleven years since that horrific day, my son has become a firefighter in NYC, and I have moved from NY to VA. It feels as though people here in Tidewater Virginia have already forgotten – and want to forget. Thank you for continuing to bear witness. I understand wanting to forget, Mary. I really do. But we can’t. If we do, then all those lives will have been lost in vain. Judy, this touched my heart in a very positive way. Though we will always grieve, we have reason to be grateful for the way it did bring us together. Sometimes, when I let myself look at those horrific images, I just can’t believe that it happened. Peggy, I just wish somehow we had found a way for it to have kept us together. I really hate what has happened to polarize us as a nation so terribly in the years since. We are all, every last one of us, teary-eyed today, Debi. That means the terrorists won. We can’t let them win like that. Those people cannot have died in vain. We have to strive to live fully each and every day. I rail, and you as a lawyer should rail, against the intrusive searches that we endure in airports now. We need to get back to who we were and not give in to what the terrorists want. We cannot abridge our constitution, our hearts and our minds like that. My father survived that day because he was safely asleep in my guest room in San Francisco. Later he rebuilt the subway station at Ground Zero, and I got to go down in to it many times during the construction. It was literally awesome. Thanks for the mental kick in the pants, Martin. We do all need to strive, hard, and harder every day, to regain what we can of the things we lost that were valuable and worth having. This ol’ pessimist may have her doubts about how much we can recapture, but that doesn’t mean we stop trying. And I envy you your opportunities to see that subway station at all stages. Today the sun was shining, the sky blue and fall in the air, just like 11 years ago. I agree with Martin that until we can just get on the airplane and fly to our destination the bad guys are ahead. But I have hope that we can come to some sort of system that offers reasonable protection but doesn’t require pat-downs of two year olds. Yeah, it’s nice that kids now don’t have to take off their shoes. But I’d personally prefer that they were irradiated or groped either. I’m with you all the way on this one, Vicki — standing true to our ideals has to be the way to go. Every year when this day rolls around, for a few days prior, there are various channels that show almost continuous shows about what happened that day. I can not bring myself to watch any of them. There are certain “events” from that day that are especially hard to watch or even fathom. The whole thing, every bit of it, is hard to watch, Jeff… and impossible for me to fathom.